Note 8 and Note 5. NOTE EDGE; MOTO MOTO 360/MOTO X PRO/MINI/DROID 5; Google NEXUS 4/5/6/7; LG G2/G3/G4/G5/G6/LTE2/DIL. longer have to fumble in your pockets or look around in between the car seats for your phone. you to switch your phone's position in a snap. damaging your air vent and to increase hold strength. [Two Charging Modes]: [FAST CHARGING MODE] ONLY available for the Samsung Galaxy Note 8, S9 Plus, S9, S8, S8 Plus, S7, S7 Edge, S6 Edge Plus, Note 5. [STANDARD CHARGE]: iPhone X,8,8 Plus and other Qi-enabled devices. Some devices may require the addition of a wireless charging receiver like other Phones(Not Included). 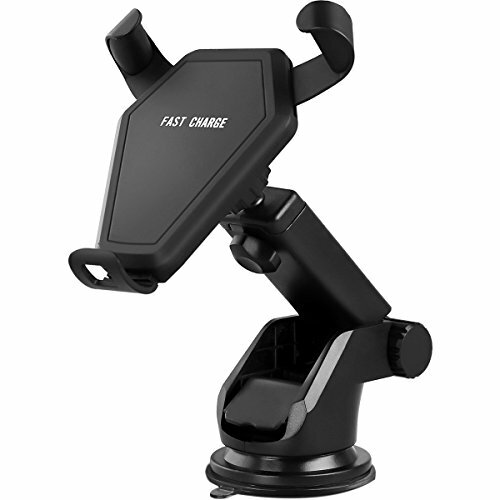 [Gravity Gripped]: Combined with phone charger and holder, no more tangled cords or cables in car anymore. Linkage design, when you put your phone into it,the two sides will automatically grip your phone. Slip upwards to take your phone out. One hand operation, easy and convenient. [2 Install Ways]: Support vent mounting seat and bracket base installation as your prefer. Air vent installation way helps cool down your phone while charging. Bracket base way supports 360°rotating, you could adjust your phone to the best position. [Smart Charger]: This wireless charger is smart design, with the built-in over-voltage, under-voltage, temperature control, surge protection and short-circuit prevention features, it's trickle charge and when the battery power reaches 100% the charger will automatically interrupt the charge, we ensure ultimate safety for your phone. [Kindly Note]: You need to adjust the Adjustable Bottom Bracket in order to match up with the phone's receiving area and the charger's sensing area. For best performance, remove the phone case or use slim case. If you have any questions about this product by WATACHE, contact us by completing and submitting the form below. If you are looking for a specif part number, please include it with your message.